1. Serve a savory pie. Instead of saving pie for dessert, satisfy your guests with a savory tomato or veggie pie as the main meal. We recommend setting up a buffet where everyone can help themselves to whatever flavor suits his or her fancy. Guests will love the rustic pie vibe, but will be excited by your original approach to the big day meal. 2. Pie on the fly. After a long night of dancing, your guests are sure to be hungry as they head out the door. End on a sweet note by handing out individual servings of pie with pre-packaged ice cream cups. Get creative with packaging by stamping the box with your monogram or a cute phrase, and don’t forget to include a disposable fork or spoon! 3. 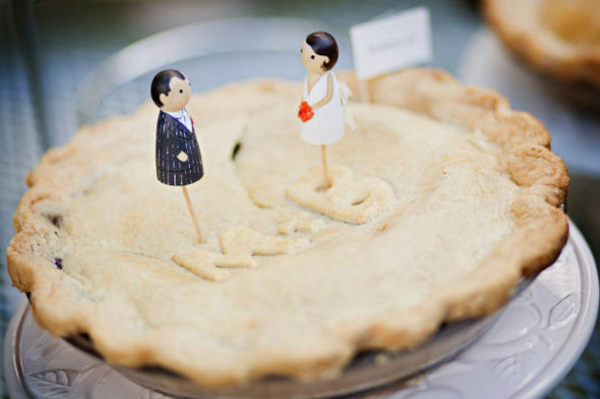 Provide a groom’s pie. Skip the traditional groom’s cake (apologies to all the red velvet lovers out there!) and serve up a pretty pie instead. Guests will still have the option to eat traditional wedding cake, but they’ll be happy to have some options. And, the real dessert lovers will be psyched to load up on both! 4. Make it meaningful. Take the opportunity to tell a story with your dessert by serving a pie recipe with some sentimental value. Whether it’s your grandma’s famous apple pie or a pie made from fresh fruit from the farm down the road, guests will love that you put thought into your choice. We suggest adding cute signage or a handmade blue ribbon to tell guests why it’s so special. Another nice little touch would be to provide recipe cards for all your guests to take home!